In April 2018, Dr. Lewis was contacted by The Independent UK to review Feed the Baby Hummus, Pediatrician-Backed Secrets from Cultures Around the World. The Interview resulted in the following article, which was viewed by millions of readers in American and Great Britain. Lisa Lewis, a paediatrician and author of “Feed the baby Hummus,” first began researching cultural differences in child-rearing techniques 20 years ago. She told The Independent: “What really got me going was over twenty years ago when I first noticed that there were cultures around the world that put their babies to sleep differently. From there, Dr Lewis began to travel the world and investigate the numerous cultural differences in raising children – and how each of these methods can benefit babies. What she found was surprising – and shows a clear difference in how cultures around the world rear children. But, as with most of the tips and techniques on the list, she would never judge or recommend one technique over the other – she just wants to inform parents that there are other options. These are five tips from around the world that Dr Lewis has come across. When Dr Lewis became a parent herself, she followed her own Lebanese roots and adopted a method of co-sleeping “100 per cent,” where the baby has a separate sleep area, such as a co-sleeper or bassinet, in the same room. Although the baby is not in the bed with the parents, as that increases the risk of Sudden Infant Death Syndrome, they are right next to them. However, the method is vastly different from methods parents in the US use to get their babies to sleep. According to Dr Lewis: “We had bred a culture of ‘this is the only way to get your child to sleep' and that is not true,” referring to the cry it out method, where babies are left to cry in a separate bed or room. A common parenting belief is that babies need to eat very bland pureed foods. But from her own travels and studies of parenting techniques around the world, Dr Lewis has discovered that babies can actually eat flavoured food at a very young age. And the science behind raising non-picky eaters is backed by other paediatricians, including Tamara Melton, a dietician and nutritionist at the Academy of Nutrition and Dietetics, who agrees that introducing your children to a variety of food at a young age can prevent them from developing picky eating habits. To encourage them to try new flavours and spices, Dr Lewis recommends adding in yoghurt and making it not quite as strong. 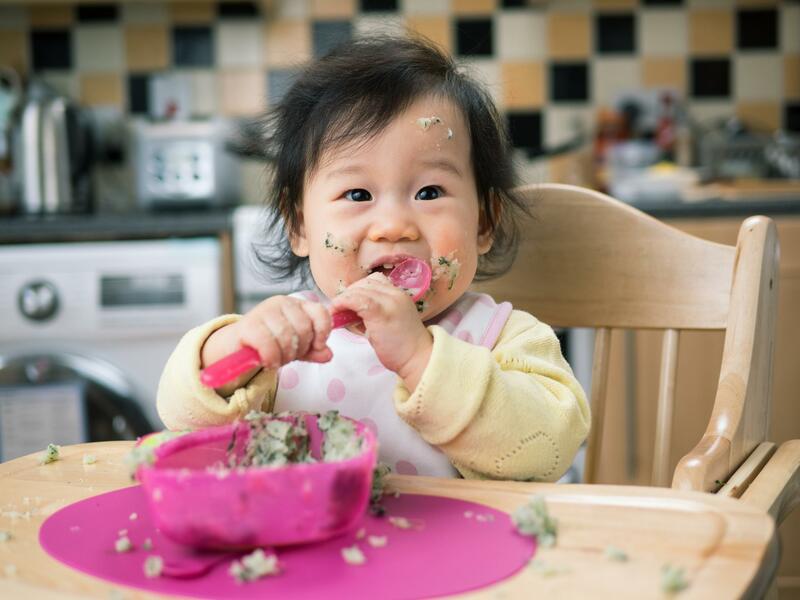 As long as it is pureed, babies can pretty much eat anything – including hummus. Although Dr Lewis admits she is still researching, she is worried about the chemicals babies are exposed to – and what effects these can have on their developing brains. For Dr Lewis, one of the main concerns surrounds sunscreen which is often scented and filled with chemicals. Typically relying on a “better safe than sorry” approach in her own practice, Dr Lewis learns from cultures that don't have these products – and instead rely on options such as Zinc oxide due to its “high safety profile,” or coconut oil. With these products, none of the ingredients contains chemicals. The American Academy of Paediatrics says don’t give babies water but over her period of practice, Dr Lewis said: “I have seen so many mums give them water and feel they need water. For Dr Lewis's practice, she incorporates the cultural difference by recommending new mums give their babies 10 ml twice a day of water – but no more than that. Although the technique hasn’t been researched, Dr Lewis hasn’t seen any evidence that this amount of water can be harmful to a baby. According to Dr Lewis, especially in France, there is a really large comfort culture surrounding separation anxiety and the use of teddy bears to ease this anxiety. “Separation anxiety and how babies have trouble separating is huge and knowing that they may need a comfort object,” Dr Lewis told us of child-rearing in the UK. As children can feel separation anxiety from a young age, “security objects are very important” in certain cultures. And, Dr Lewis noticed that British people typically keep their childhood teddy bears into adulthood. But while teddy bear culture is accepted in the UK as normal, other cultures deal with separation anxiety differently – some by not separating from their newborns at all. In Indonesia and other cultures, they believe “in holding the baby totally in the first year of life,” a technique referred to as extensive holding. According to Dr Lewis, the belief is that children’s feet should not touch the ground in the first 105 days – which Dr Lewis calls the ultimate nurturing. “Somebody is always holding the baby. The baby is not left alone or put on the ground or the floor,” she told us. For more parenting tips from around the world, you can buy Dr Lewis’s book “Feed the Baby Hummus: Paediatrician-backed Secrets from Cultures Around the World” here. To reference the original post, visit The Independent UK, Five Parenting Tips from Around the World, According to a Paediatrician. A treasure trove of childcare tips, and a clever cross-cultural journey. Every part of the book affirms the parents' rights to make their own choices. It offers wide-ranging ideas and practices, but more than that, it offers confidence in parental judgment. This is refreshing in a time when so many discussions of infant parenting are fueled by extremes – never do this; you must do that. Feed the Baby Hummus is a guide to nurturing happy, healthy babies that goes beyond conventions. Exceptionally well researched, written, organized and presented. A delightful and practical read for all expecting moms and dads. I wish I read it before becoming a parent! Celebrate their life, hold them when they cry, feed them food that is nourishing. The baby-parent-community oneness is age-old common sense. The careful reader should find inspiration from this book and reflect on how to respectfully honor this precious time in an infant's life while relying on practical guidance from a pediatrician who values human connectedness and culturally grounded wisdom regarding babyhood. An easy-to-read parenting book with a twist. Complementing the usual pediatrician guidelines for safe baby care, Lewis concludes each section with tips from global baby-care routines. Indian massage. Jamaican rosewater bath. Sumatran rocking. Jewish naming rituals. American parents will find a treasure trove of practical and time-tested suggestions here. This reader-friendly guide will make a charming baby shower gift. Dr. Lewis' new book offers parents a truly unique guide to child-rearing. Feed the Baby Hummus not only provides traditional and time-tested parenting advice from the West, but is also interspersed with parenting stories, customs, traditions and even baby food recipes from around the world. In reading this book we realize how much there is to learn from the global parenting village. Dr. Lewis' pediatric expertise combined with examples from around the world makes this book an insightful and comforting companion to new parents everywhere. I have often thought that if we pooled together the most positive elements of each culture across the world we would create one strong thriving society. And what better time to do this than at the start of new life. This book provides parents with the wisdom and traditions from across the globe and ultimately the knowledge to follow their own natural intuition. A great read for new parents.